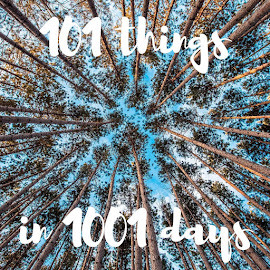 The Adventures of Team Wil-Sun: Monday Motivation -- so much inspiration!!!! 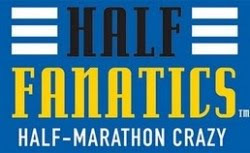 If you're reading this, I can assume that you know that today was Marathon Monday -- the 118th running of the Boston Marathon. I was lucky to be able to watch it this morning at work, as we stood around chatting and cheering, sometimes going back to our own desks to watch, but frequently regathering to chat. A pretty great way to spend a morning, eh? On my walk home today I kept thinking about different things I wanted to write about -- so much to write about! -- for please forgive me if this post is a little more scattered than usual. Monday Motivation #1: Meb Keflezighi!!! All the way home I kept singing "Eye of the Tiger", but just saying MEB. Meb! MebMebMeb! MebMebMeb! Meb Meb MEEEEEEHHHHHHBBBBB!!!! I'll admit it -- I've liked Meb for years, from when he won the New York City Marathon in 2009 (first American man since 1982), to when he won the Olympic Marathon trials in 2012, and his two great finishes at the Olympics (a silver in 2008, 4th place in 2012). I'll also admit that I like Meb even more since Nike bizarrely cut him in 2011, and that he races for Skechers. Yep, Skechers. In fact, I think Meb is my favorite male marathoner (other than Wil, of course!!!). Anyway, it was great to watch Meb run today -- I loved how he opened up a big lead, then watched in alarm as Wilson Chebet started to reel him in. It was a little like a horror movie there for a bit… it seemed like every time they changed camera angles, Chebet was just that much closer. We were all counting seconds by watching their feet as they passed road markings. Twenty seconds, then 15, then 10, then 5 or 6… But in the end, Meb prevailed, becoming the first American man to win Boston since 1983. I noticed Emma Stepto just before the elite women's start. She was wearing a bright yellow top, but I couldn't really see any detail. I did wonder if maybe she was a Brooks runner that I didn't know. I spotted her a few more times during the coverage -- turns out she was the second fastest British woman in the marathon, coming in at 2:36:05, good enough for 14th overall. 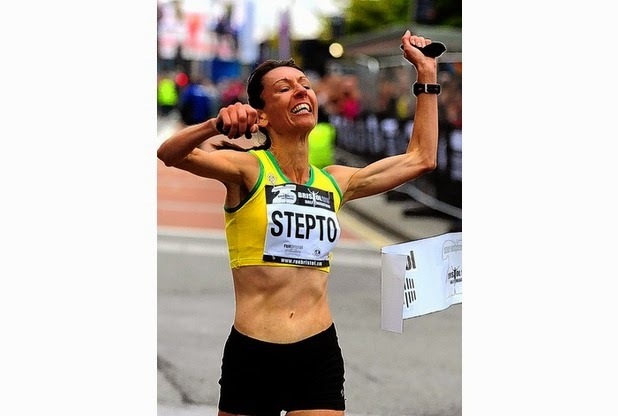 After watching the race I looked her up on Bing, and found a very cool post on the Improbable Runner blog, which informed me that Ms. Stepto is … FORTY FOUR. Not only that, but she didn't start running until she was in her 30s. Well, there it is -- it's really never too late to start running! Nice coincidence: I found her on Twitter (@emgogogo), and she thanked @brooksrunninguk after the race. So maybe she is a Brooksie of sorts. I've written about total badass Tatyana McFadden before… after she won the NYC Marathon (and, of course, Chicago, Boston, AND London in 2013…). I was surprised and happy to see her during the London marathon, as I didn't know whether she would be racing. After all, she had changed her focus (albeit temporarily) to cross-country skiing. Oh, did I mention she earned a silver medal at the Paralympic Games in Sochi the other month? Yeah, she's that sort of athlete. The men's wheelchair race in the London Marathon was very close, with four men screaming down the Mall very close together. The women's race? Not so much -- Tatyana McFadden simply outraced everyone. And then this morning… there she was again, all of a sudden, winning Boston. WHAT??? Winning by more than 2 minutes? Well then. But even that isn't the best thing about Ms. McFadden. 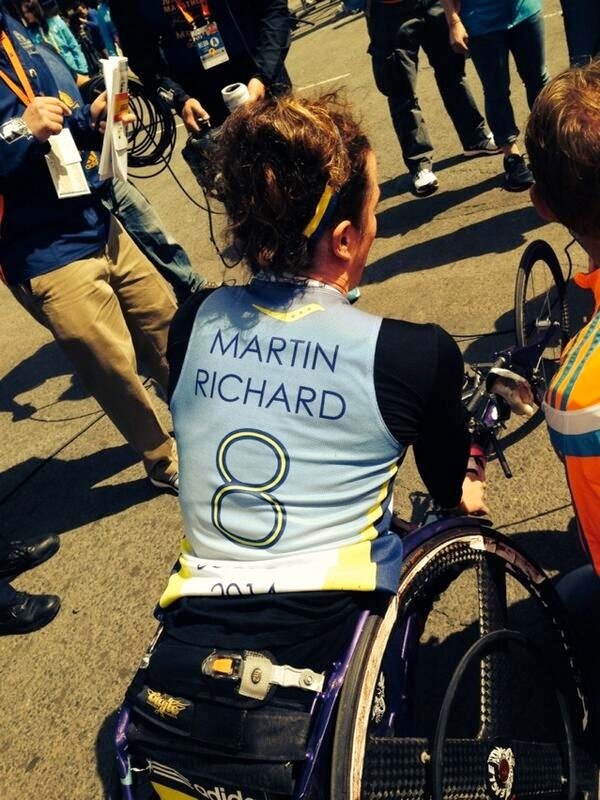 She raced today for team MR8, in honor of sweet Martin Richards, 8, who was one of the victims of last year's Boston Marathon bombings. She was wearing his name and age on her back while she raced. 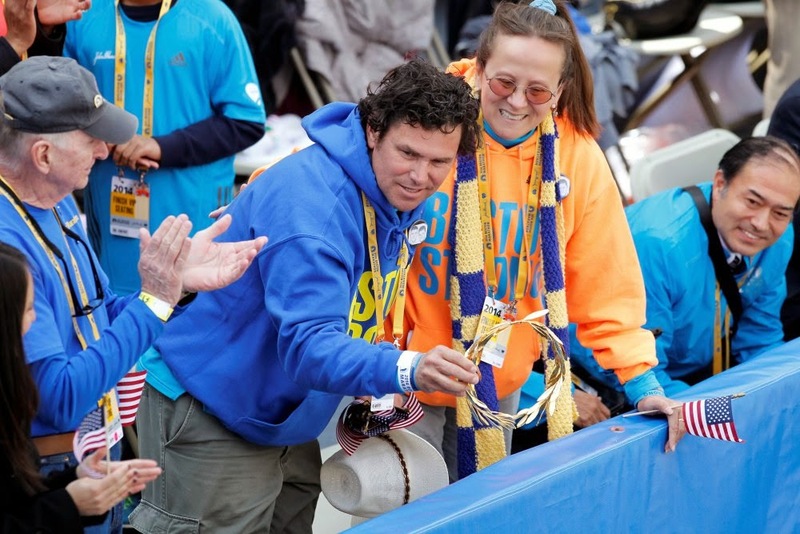 After receiving her gold-dipped laurel wreath, she took it over and gave it to Carlos Arredondo, who rushed to the aid of the bomb victims last year. So. Very. Awesome. Oh, and today is her 25th birthday. So happy birthday, Tatyana McFadden! Okay, so item #3 made me tear up just a little bit.